Perhaps more than any other C-suite role, influence is the purview of the CMO. It's the CMO, after all, who oversees brand, customer experience, communications, advertising, social media, and content marketing -- in short, the lion's share of their organization's external voice, messaging, and share of voice in the marketplace. Small wonder then that CMOs themselves would be regarded through the lens of influence, which is exactly what, for the fourth consecutive year, Forbes and ScribbleLive have done in The World's 50 Most Influential CMOs Study released this week in cooperation with LinkedIn, which supplied additional, publicly-available data for this year's report. As the analyst who crunched the data for this most recent report (on behalf of my client, ScribbleLive), I've drawn new insights about executive influence. The top-level findings are interesting to be sure. For example, 11 of this year's most influential CMOs have been in their role for a year or less; influence is dominated by men (as is the C-suite); and no industry dominates influence. Automotive CMOs dominate this year, while apparel, No. 3 last year, has slipped out of the top five industries. Tech CMOs are still influential, but lost ground this year as the vertical slipped into second place. Given content marketing is my core focus as an analyst, it's gratifying to see it is the undisputed No. 1 topic influential CMOs talked about this year. Yet the biggest takeaway, for me at least, is that executive influence comes in three distinct flavors. These should cause all executives active in social media, as well as other forms of content creation and dissemination, to ask themselves, "What kind of influencer am I, and what kind of influencer do I want to be?" Herewith, the three types of influencer. Characteristics: The news cycle influencer less wields influence than is controlled by it, via circumstances that run the gamut from positive to negative. It may be that their company has made a splashy new product announcement or has been involved in a scandal. Whether positive or negative, influence is visited upon the executive in question, and is not so much controlled as in control of their reputation, as well as sphere of influence. The best, and really only, strategy for news-cycle-induced influence is to understand real-time marketing business cases. Most desirably, news-cycle influence would be in the planned, proactive sector of the real-time marketing quadrant, but as will always be the case, this type of influence is often unplanned and unanticipated. As the saying goes, "nobody expected the French Revolution," or "United breaks guitars," or any manner of public faux pas, but plotting decision tree triage charts go far in mitigating news-cycle influence, particularly when crises or negativity are involved. 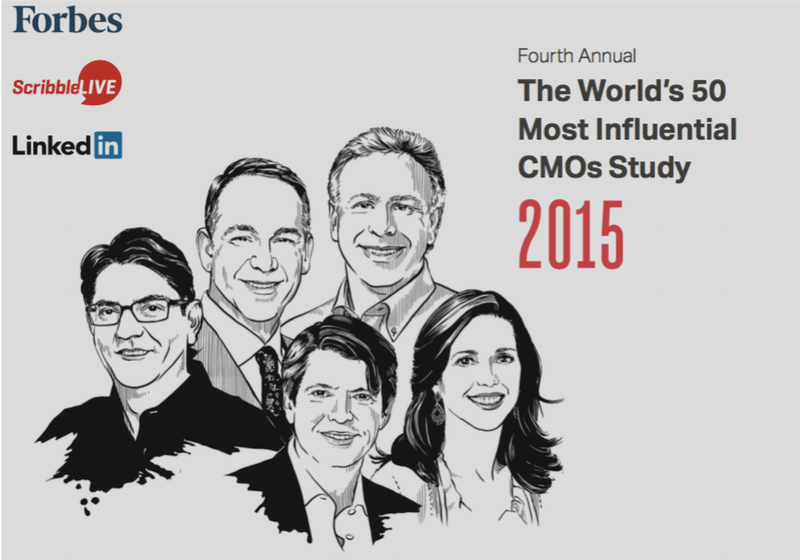 Characteristics: Most of the CMOs who made the Forbes/ScribbleLive study this year are influence wielders. They are frequent contributors to social media and to publications. They're on message, have something substantive to say, and are well-respected leaders who are well regarded by their peers. Certainly there's a halo effect. They represent powerful brands that owe no small portion of that power to the stewardship of the influences. Their influence is influenced by the companies, products, and services they represent and vice versa, creating a sort of virtuous circle of influence. Wielding substantial influence among one's peers and target audience is the goal of the vast majority of social sharers and online publishers. Characteristics: The super influencer shares the traits of the above two groups. They're both newsworthy and in the news, therefore owning above-average currency in shared media. At the same time, they wield influence. They create content that's widely consumed and shared across digital channels. Super influencers possess one additional trait that sets them above their peers on the influence scale, whether those peers are other CMOs or, outside of that rarefied sphere, whomever they share common ground with as influencers. Super influencers influence not just the crowd, but also their own peers, people on their level, as well as higher-ups. Needless to say, super influencers are a rare breed. Of the top 50 influenctial CMOs, only one, GE's Beth Comstock, qualifies as a super influencer. Does this status have anything to do with Comstock's promotion earlier this year to vice chair of the company? It would be hard to argue otherwise.